I have been living in the Farmhouse ” la volpe e l’uva ” in Perugia here 1996, with my husband who is a musician, and our two children. Let’s Cook in Umbria was born thanks to my love for the region of Umbria, its products and traditions. 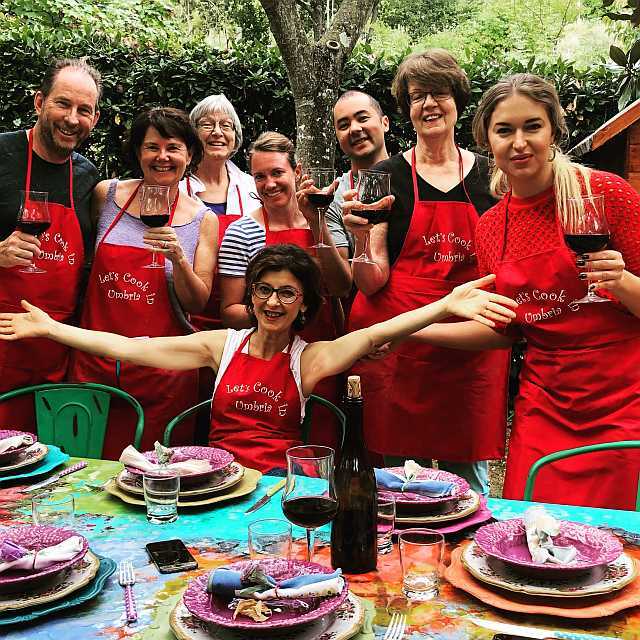 My goal is to offer an unforgettable holiday in central Italy that combines Italian food, art, and our local culture, an holiday during which people can live in a real farmhouse surrounded by Umbrian hills, discover the secrets of our traditional cooking and enjoy of the artistic richness of our wonderful region! My programs include accommodation in the farm, cooking classes, half-day tours, italian language lessons and meals. You will deal with the professionalism of people in an informal and friendly environment. My approach to cooking can be wrapped up in three words – simple, seasonal, and local. Our recipes come from the Mediterranean tradition, especially form central Italy (Umbria and Tuscany). The cooking classes are held in my home. 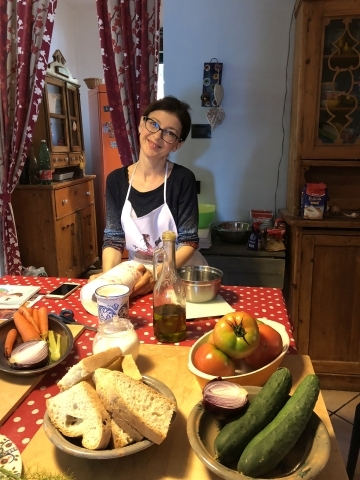 Let’s cook in Umbria is where I live, and staying at my farm you’ll take part of my life, sharing with me your experience, family and friends! In my class I shares my traditional recipes with you—as well as my vegetarian specialties! I guides you through the preparation of simple but delicious Italian recipes and reveals some of my culinary secrets! A special role in my cooking programs is played by my mother-in-law Alberta, she manages the agricultural aspect of the farm, she produces an excellent red wine, extra virgin olive oil and she has a large vegetable garden where grow the vegetables that we will use in our cooking classes. She organizes the work during the Olive Harvest package. My husband is a musician, saxophonist, and during the cooking classes you can listen his wonderful music! My five coloured chickens contribute to the success of my cooking classes producing every day eggs for our recipes. In our team I can not forget my sweetest pet Bianca and my funny cats that keep us company during the classes! Simplicity, fantasy and attention are the mainly ingredients in my classes, and they are the base of the pleasure of cooking together. The programs on my pages are very flexible and people interested can ask me for changes, i.e. the length of the vacation, the number of cooking lessons and the number and type of excursions. We can plan together your personal holiday! I personally answer to your email! There is so much to do and see in Umbria, so let’s get started, shall we? 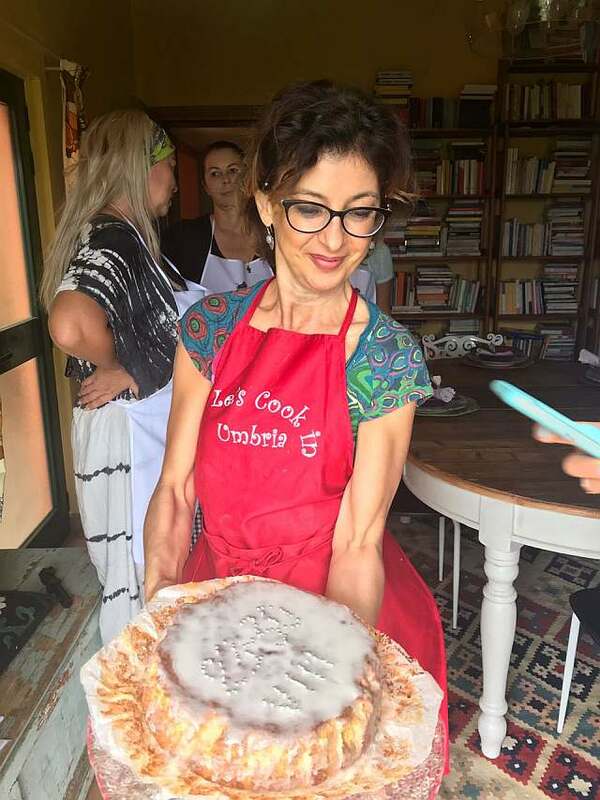 I have listed a number of our COOKING PROGRAMS, we have lots to offer – and we think you’ll like what you see! Hoping to see you soon here in Umbria. I send you all my best.